It’s that time again. 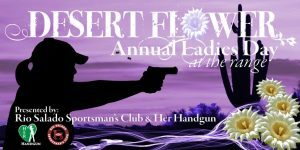 For the Rio Salado Sportsman’s Club’s 3rd Annual Ladies’ Day at the Range. Mark your calendar for Saturday, April 29th! So grab your female co-workers, friends and family members who are interested in learning to shoot and get them registered for this special day!